When one speaks with flowery words, beating around the bush rather than zeroing in on the point of conversation, one is said to speak with too much "palabok". 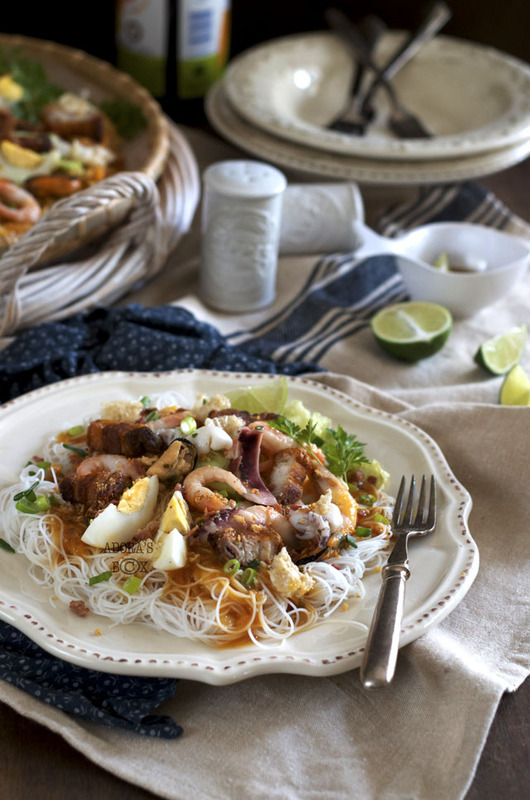 This Filipino term is also the name of a dish with so many accoutrements: the pancit palabok. The dish, unlike the saying, is outright delicious at the first mouthful. 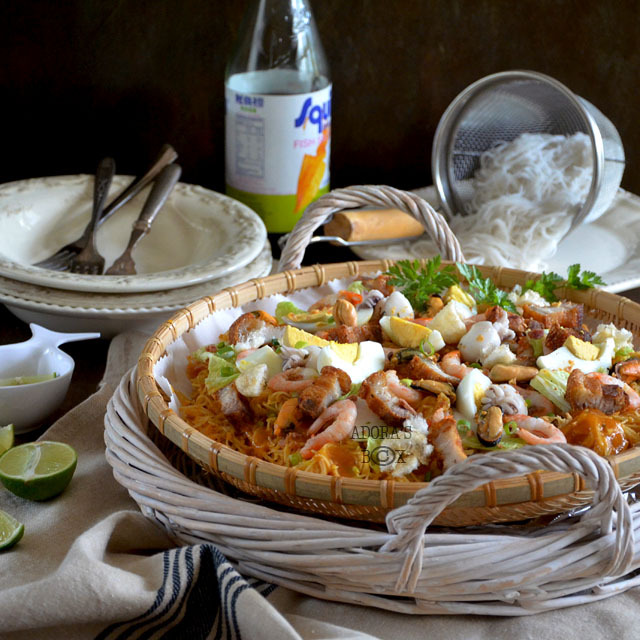 Pancit palabok (also called pancit luglug or pancit Malabon) is a noodle dish that is the best example of layering of flavours. The base is rice noodles upon which a thick caldo (prawn/shrimp gravy) is poured on. The rest of the ingredients are toppings: blanched Chinese leaf, fried pork, cooked seafood, ground chicharon (pork crackling), slices of boiled egg, fried garlic and spring onions. Although the most important part of the dish is the caldo, the taste of the dish is a result of the combination of all the flavours. 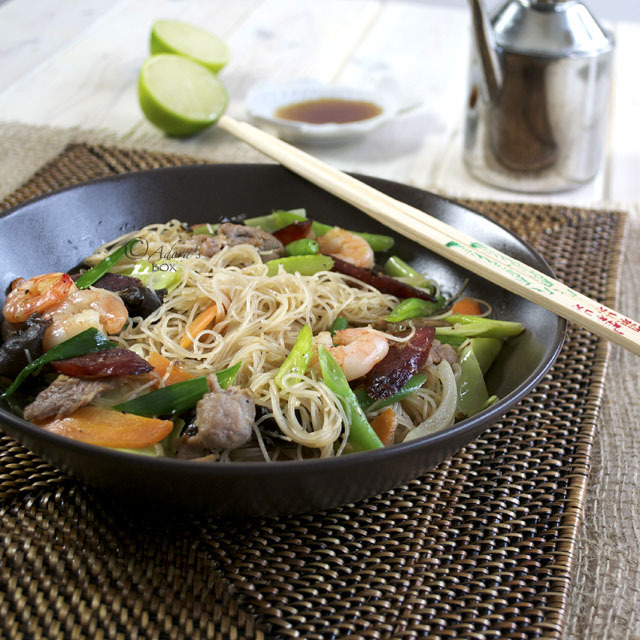 This noodle dish has several variations. 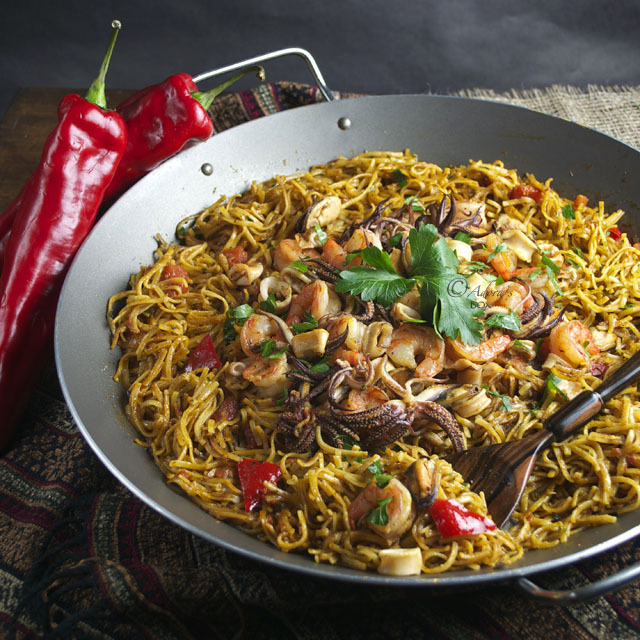 Pancit luglug is basically the same but two kinds of noodles are used (egg noodles and rice noodles) and sautéed vegetables are also among the toppings. The long handled strainer, used for blanching and straining the noodles (see photo) is called luglugan because it is specifically used for this dish. 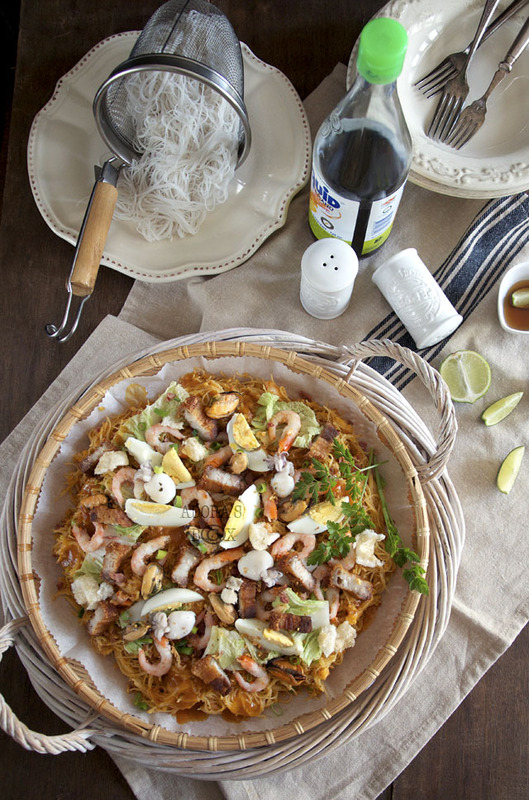 Pancit Malabon is the same as palabok but thick rice noodles are used instead of thin ones. Preparing the dish can be a laborious process so a lot shy away from preparing it themselves. There are a lot of shortcuts and pre-prepared ingredients now available to make things a whole lot easier. I use cooked North Atlantic prawns for the gravy. Seafood cocktail and leftover or shop bought roast pork can be used for topping. It only takes a few seconds to grind the the ingredients in a few processor. 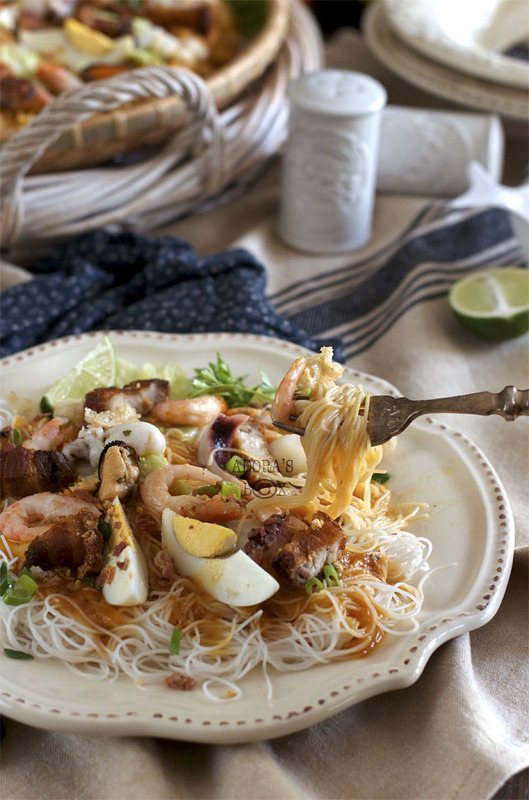 I make my palabok a bit differently from the traditional way. I have adapted a few techniques to make the palabok tastier. I have done away with pounding raw prawn/shrimp shells to extract the juice. Not only do I find that task revolting, I also question whether that gives the sauce the best taste. 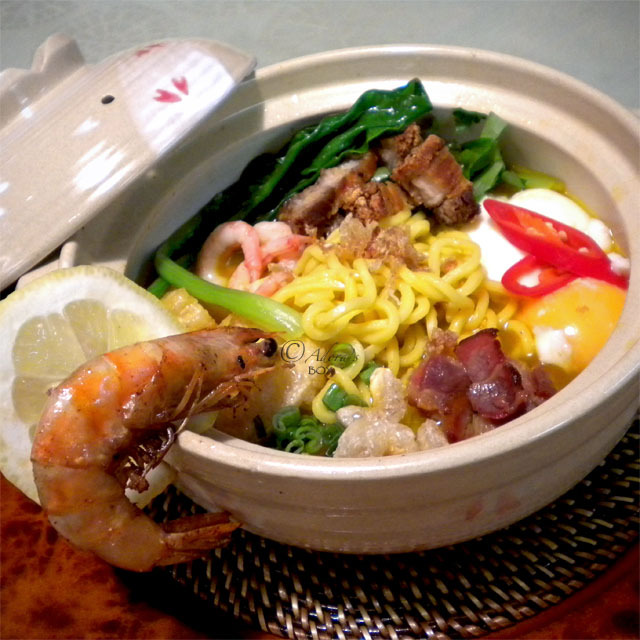 I use cooked prawn shells, fried first to give it maximum taste, then simmered to make a stock. 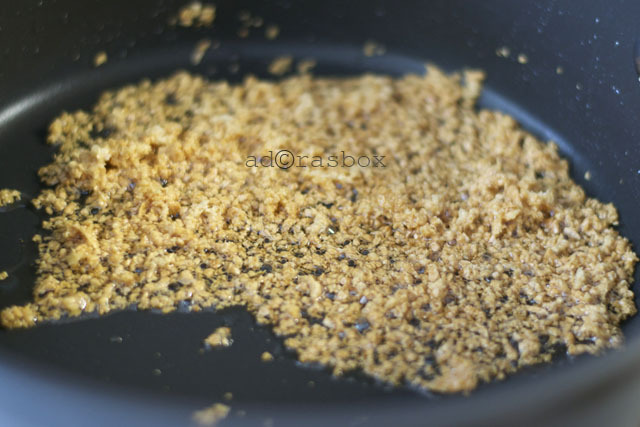 To push the prawn flavour further, I toast ground dried prawns and add it as a topping. I am not a fan of smoked fish so I do not use that. Instead, I use smoked bacon bits ('cause I'm a fan of pork) to give it a slight smoky edge. Along with fried pork, boiled eggs, crispy garlic and chicharon crumb goes ready cooked seafood cocktail and of course the prawn meat. How can that go wrong tastewise? You can add any other toppings you wish to add such as fried tofu or smoked fish (tinapa) flakes if that's your thing. This dish is one of the truly Filipino dishes I am proud of. 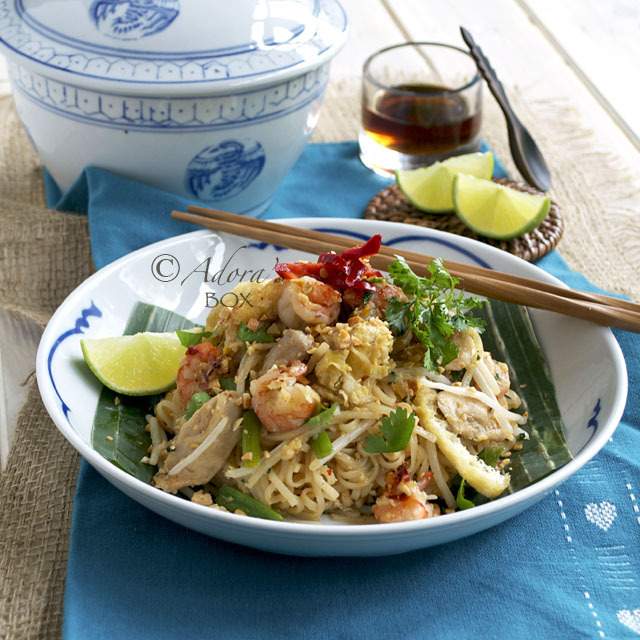 It is so delicious and combines all the flavours that we like to make one beautiful dish. As you read the recipe, you will realise that it is not really that difficult to make. I hope you do try out this version and proudly share it with your friends. This is one of our heritage dishes worth keeping. Boil the pork rashers in water seasoned with salt and pepper until tender. Set aside to cool. Reserve the stock. Shell the prawns. 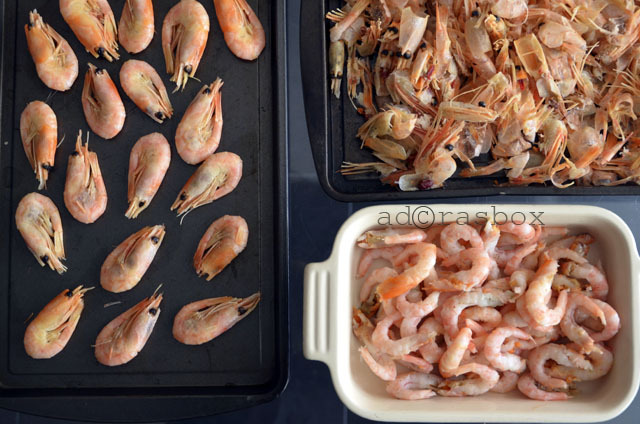 Set the prawn meat aside and use the shells and heads to make the prawn stock. Chop half of the prawn meat and use the whole ones for topping. Deep fry the pork on medium heat for about 10 minutes. Leave to cool, then fry again in very hot fat until the skin is blistered. Chop into pieces. 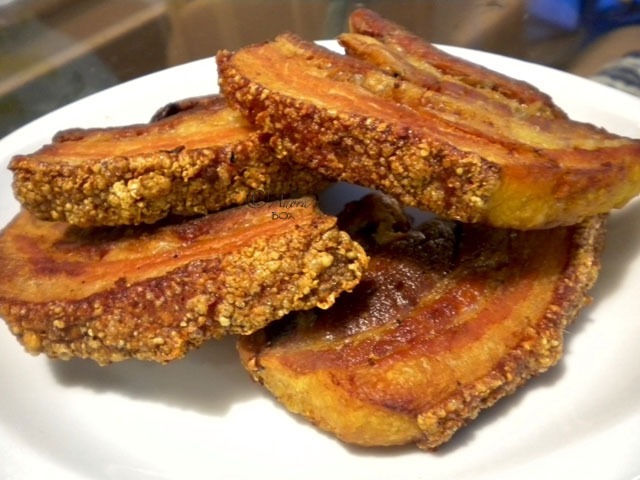 You can use lechon kawali, Chinese lechon or bagnet instead of the fried pork. Heat up 3 tbsps. 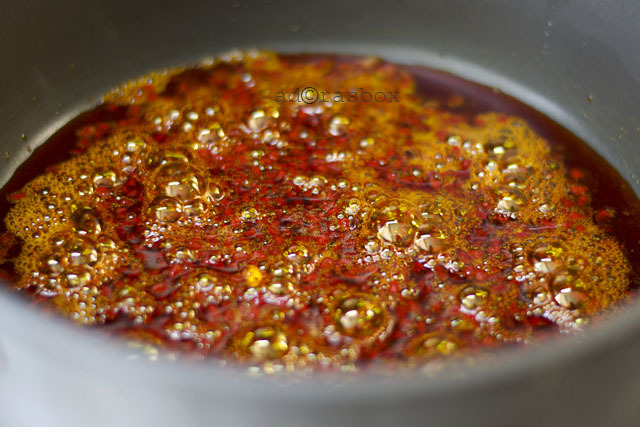 of oil (used for frying the pork) in a pot or wok. Fry the garlic until light golden brown. Skim the garlic off and set aside. 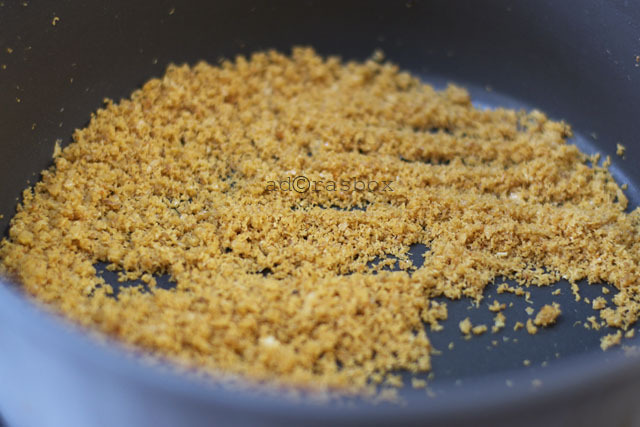 Grind the soaked dried prawns finely in a food processor. Add to the oil used for frying garlic. Sir fry until toasted and fragrant. Add 1/2 tsp. each of salt and sugar and a good grind of black pepper. Stir then transfer to a bowl. This is so tasty and good for sprinkling on anything. Make some extra and keep in a jar. Heat up another 1/4 c. of the oil used for frying the pork. 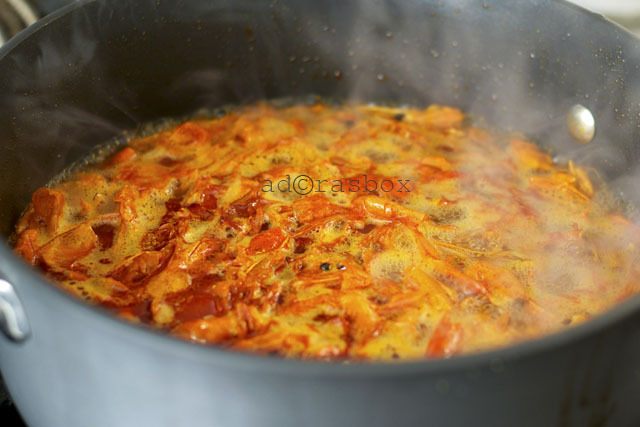 Add in the annatto seeds and turn off the heat. Stir until the oil is stained deep orange. Skim off the seeds and discard. 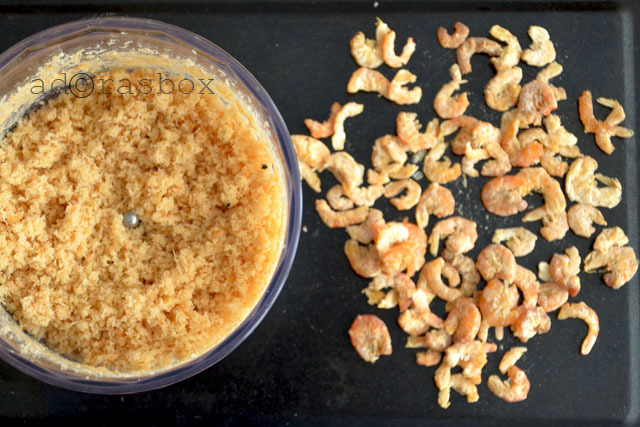 Fry the prawn shells until toasted in the annatto oil. Add the stock. Bring to a boil and simmer for about 20-30 minutes until you have a rich prawn stock. Pass through a strainer. Use a spoon to press all the juices out of the shells. You should make about 2 1/2 c. of stock. Wipe the pan clean. Transfer the stock back into the pan. Mix the flour and water then strain into the stock and stir with a whisk. Cook on low heat while constantly stirring until thick, 2-3 minutes. Season with pepper. I did not add salt because the stock and the prawns are already salty. The toppings and the fish sauce served with it would also add saltiness. Set aside. cooked seafood cocktail for topping, about 1/2 c.
Cook the rice noodles in plenty of boiling water for 3 minutes. Strain. Cut the Chinese leaves (pechay Baguio, Napa cabbage) crosswise into 1" wide strips. Blanch and drain. If making a big serving, mix the noodles with the caldo (prawn gravy), add half of the chicharon, the chopped prawn meat (from the prawns used for making the gravy), 2 tbsps. of the fried garlic, half of the dried prawns and the white parts of spring onions. Sprinkle the rest of the chicharon, the dried prawns, the bacon, the green parts of the spring onions and more garlic on top of the noodles. Scatter the Chinese leaves (pechay Baguio, Napa cabbage) on top. Lastly, arrange the seafood, fried pork and boiled eggs. 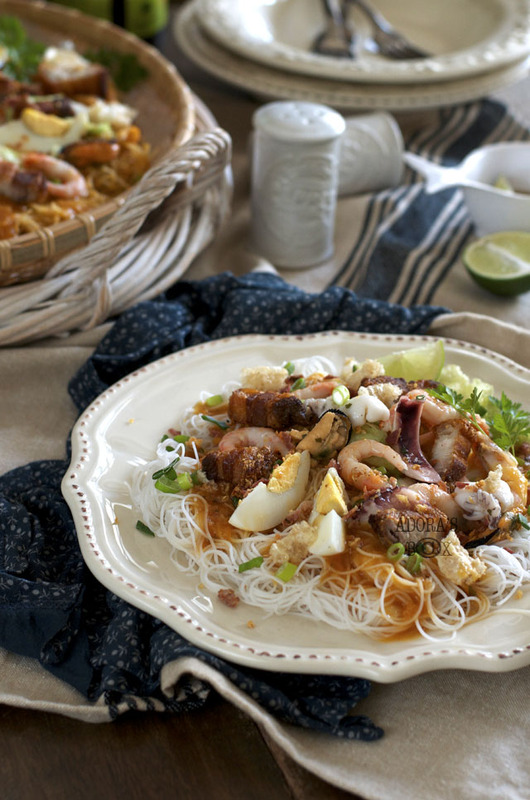 Serve with fish sauce and calamansi or lime wedges. For individual servings, divide the noodles between plates. Top with the caldo (prawn gravy). Add the sprinkles and toppings.